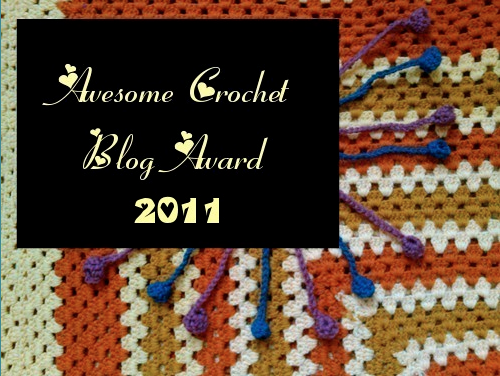 Stitch Story: I Won an Awesome Crochet Blog Award! I thought I had done my last blog post for the year, and then I woke up to a wonderful surprise this morning! My blog has been chosen for an Awesome Crochet Blog Award, for Best Accessories, given by Kathryn Vercillo of the Crochet Concupiscience blog. She reads hundreds of crochet blogs, and came up with the fun idea to give a unique award every day in the month of December, to a crochet blogger. Here is a list of all of the blog awards she has given. You might discover a great new blog to read! Kathryn really deserves an award for her amazing blog, and for her tireless effort in researching and promoting the art of crochet. She says it is her goal to strengthen the crochet community, and I believe she has succeeded! I love her positive attitude and encouragement. She has made my day many times with the thoughtful comments she leaves on my blog posts, and makes me want to keep on blogging! Designing crochet accessories is really my passion and I am thrilled to be recognized for it. It is the best way to end the year of blogging! Thank you so much, Kathryn! I am looking forward to being able to share more accessory designs in 2012!